From start to finish everything with this transaction was flawless. This was my first time ordering fish online and I was hesitant to say the least. The fish arrived in a timely manner and most importantly with zero casualitites. After an acclimation to the tank the fish were released to their new. . . .
Protomelas taeniolatus (Fire Hap) (Super Red Empress) is a German line bred version of Red Empress. They tend to color at a smaller size than basic Red Empress; but, sometimes can be difficult to get to color. The line in their midbody may reappear when they are stressed or uncomfortable with a new tank. Base Price is set to a 3 Part Color Male. Mildly aggressive haplochromis that mixes well with most other haplochromis, peacocks, milder mbuna, and milder Lake Victorians. 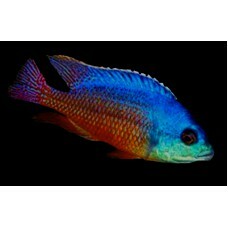 Part color males can sometimes look similar to part color Lethrinops Intermedius (Oto. Tetrastigma). It is not wise to mix males of these two fish when they are too similar in color. When they get to full color, they normally do better together. Best kept in single male tanks with milder peacocks and milder Lake Malawi Haplochromines. Protomelas sp. Steveni Taiwan Reef males start out with a blue face and a yellow and red body with b..
Protomelas sp. 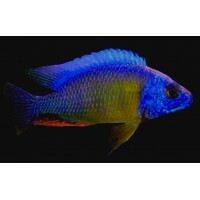 Spilonotus Tanzania Blue Gold goes by a number of different names in the industry. Ma..